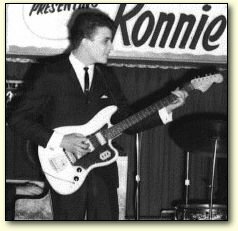 In photos of Ronnie Hawkins and the Hawks from 1963, Rick Danko can be seen playing a six string Fender bass. This has stirred up some curiosity about the instrument in the guestbook at this site. Below you'll find more information about the Fender Bass VI, from various sources on the net. Thanks to Serge Daniloff for the photos of Danko and the original Bass VI used by The Hawks. The Fender Bass VI is sometimes referred to as a baritone guitar and sometimes as a six string bass guitar. It is a fairly rare bird. From 1961 to the early '70's less than 7-800 were made, but copies / reissues are now available. 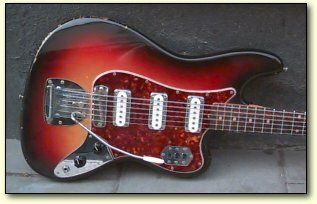 In the February 1989 issue of Guitar Player it is claimed that Leo Fender intended the Bass VI to be a bass and, with its extended upper range, a baritone guitar as well. The regular six-string guitar, for example, is usually said to have the baritone voice among the plucked strings, so to speak of a "baritone guitar" is, in one sense, a redundancy. By modern standards, a 6-string bass means large fretboards, complex onboard electronics, EQs and CGDAEB tuning. Like it's forerunner, the original Danelectro UB2 '6-string bass' of the mid-50s, the Fender Bass VI is a six string guitar with 'old-style' passive electronics, tuned a full octave lower than standard guitar tuning. This means that the low E string is the same pitch as the low E of a bass guitar. A Bass VI neck is in between an electric guitar and an electric bass guitar in length. These qualities make it truly a jack of all trades and master of none. When you play high up on the neck, it is the same pitch as the lower notes on a guitar, but the tone and timbre of the sound is quite different. The lightest string on a Bass VI is .025", and is wound stainless steel over a steel core, while the thinnest string on a guitar is .010" or so, and is plain steel wire. This makes the tone of the two very different. Rick Danko's original Fender Bass VI, now redone in blue. Both George Harrison and John Lennon used the six-string Fender bass on the White Album, Let It Be, and Abbey Road (McCartney stuck to the Hofner, Rickenbacker and 4-string Fender Jazz Bass.) Other notables known to have recorded using the Fender VI include Peter Green, Jack Bruce (Cream), Steve Kilbey (The Church), Eric Clapton (at least he owns one), and Robert Smith of The Cure, Listen e.g. to Smith's use of the Bass VI on several tracks on the Disintegration album from 1989, where the electric guitar only plays the off-beat chords, while the melody is played by Smith on a Bass VI. The result is a much spookier sound than provided by a guitar. A very different beast--not a guitar, not a bass, six strings and looks like a Jag. The first time you play it it's an out of body experience--it feels like a guitar, then a BOOM comes out. Good points: Small neck (30" scale and very guitarish), interesting and different tone, and six strings means you can do some interesting things (lots of 2-3 string chords, droning, even bung in the occasional chord). And it has a tremelo! Bad points: Lacks some low-end balls without sufficient amplification, hard to play at first (lots of strings close together), usually need to play with a plectrum. Originally from the 60s and not really successful, now reissued due to resurgance of surf music. Apparently a tele-style reissue is also available. It records very well and sound engineers like it as it seems easier to get a good FOH sound. The Fender Bass VI - Collectibility Rating: 1961-1963: C+, 1963-1965: C-. 6 string, 3 Strat-like pickups with metal frames, master volume and tone knobs, 6 adjustable bridge saddles, removeable bridge cover, Jazzmaster type floating tremolo, 30" scale, rosewood fingerboard. 3 on/off switches for each pickup. Black peghead logo replaces gold logo. Polyester finishes replaces nitrocellulose finish. 1975 Bass VI Discontinued. Re-introduced Japanese 1962 reissue in 1995.